Ali, a 2008 U.S. Olympian from Brooklyn, won on scores of 100-90, 97-93 and 97-93, although the shutout scorecard from judge Alan Rubenstein seemed way out of line. ESPN.com also had Ali winning 96-94 in a spirited fight. "I'm thrilled with my victory," Ali said. "It's a dream come true to fight here at Madison Square Garden. I'd like to fight a top-10 contender in my next fight. He was a tough fighter. He hits very hard, but I was able to take his punches." The fight was generally Ali's speed, movement and quick right hand against Santana's relentless pressure. But Ali landed some hard shots, too. He rocked Santana in the second round with an uppercut and followed with a couple of hard left hooks. 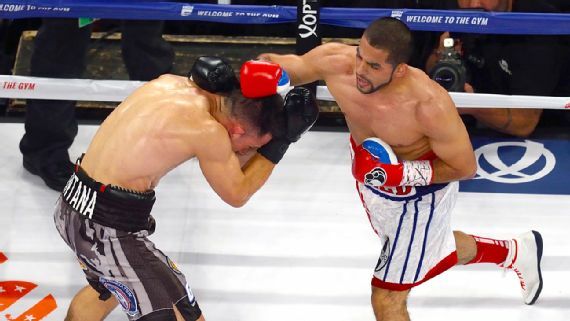 But Santana plowed forward throughout the fight as Ali (22-0, 13 KOs), 26, who was coming off a dominating ninth-round knockout of dangerous Luis Carlos Abregu in November, moved backward and to the side and tried to catch Santana coming in. Santana exerted a lot of energy with his constant movement, but when he would stop and throw, he'd fire four- and five-punch combinations, while Santana was looking to land more power shots. Ali's movement looked like it was frustrating Santana, who got more and more wild with his punches as the fight moved along. His face and eyes were also marked up and swelling by the eighth round. Ali's right eye was red and puffy, as well. Ali landed a good left hook and a right hand and wobbled Santana in the final round, bringing the crowd to life. Santana (22-4-1, 11 KOs), 28, of Santa Barbara, California, who saw his 10-fight winning streak end, fought back hard, turning it into a bit of a brawl in the final minute. "It was a tough fight," Santana said. "I don't know if I won the fight or not. I thought I came on strong at the end, but I'm not sure if it was enough. It was an uphill battle. He is a strong fighter, and he did hurt me a number of times. I give him full credit for a great fight." According to CompuBox statistics, Ali landed 196 of 588 punches (33 percent) and Santana connected on 153 of 720 (21 percent). • Heavyweight hopeful Charles Martin (21-0-1, 19 KOs) knocked out Tom Dallas (17-5, 12 KOs) with four seconds left in the first round of their scheduled 10-round bout. Martin, 29, of St. Louis, was being carefully watched by HBO executives, who might be interested in putting him on the air in a meaningful bout. But Martin did not get much of a chance to show what he has against Dallas, 30, of England, who folded quickly. Martin cut him over the left eye and, late in the round, landed a solid right hand that sent Dallas into the ropes. Martin charged to him and landed a clean left hand that caused Dallas to slump over. He appeared to be in duress, and referee Pete Santiago stepped in to wave off the fight. • Ukrainian cruiserweight Iago Kiladze (23-1, 16 KOs), 29, used Rayford Johnson (11-19, 5 KOs), 34, of Longview, Texas, for target practice for four rounds before stopping him with one second left in the fourth. With a large Ukrainian crowd cheering him on, Kiladze took it the smaller and totally overmatched Johnson from the opening bell. Johnson's only offense was when he tackled Kiladze at one point. In the fourth round, Kiladze landed three right hands, including one heavy one that drove Johnson to the ropes. As Kiladze began to unloaded, referee Johnny Callas stepped in to stop the bout. • Junior welterweight Kenneth Sims Jr. (6-0, 2 KOs), who served as one of Manny Pacquiao's sparring partners during his training to prepare for next week's fight with Floyd Mayweather, routed Luis Rodriguez (3-3, 2 KOs) in their six-round bout. Sims, 21, a standout amateur from Chicago, won 60-54 on two scorecards and 59-55 on the third as he outboxed and outpunched Rodriguez, of Puerto Rico. While Rodriguez slipped in a few solid right hands, Sims shook them off. While working out at Freddie Roach's Wild Card Boxing Club in Hollywood, California, he caught the Hall of Fame trainer's eye and was asked if he would work with Pacquiao. Work he did. Sims said he sparred 39 rounds with Pacquiao over the past six weeks to help get him ready for Mayweather. It was experience that Sims said will help him in his career. "You get experience, that's the main things," Sims said. "It was a great confidence boost for me. Freddie said I did great. That's a big step, being in there with one of the best. It was an honor." Sims said he didn't talk with Pacquiao much, but Pacquiao did ask him how old he was. When Sims said he was 21, he said Pacquiao told him he was young and that he had a great future ahead of him in boxing.